Whether you are from Italy, New York, or Timbuktu; a pepperoni and cheese traditionalist or a gourmet creationalist, most people can appreciate a good pizza. And a home-made one is even better! Now everyone knows that the crust is the hardest part to get right when making a home-made pizza. What if you could remove that part all together? I know what you’re thinking…. “Come now! You are not suggesting that we buy store-bought pizza dough/crust are you? That stuff is disgusting!” And OF COURSE NOT! I would never suggest such a thing! It is blasphemy to pizza everywhere! What I am suggesting is to not use pizza crust at all! I have a made a wonderful discovery. It is called Naan bread! You can buy this in both original or garlic flavored. (as you have probably guessed, garlic flavored is my favorite). 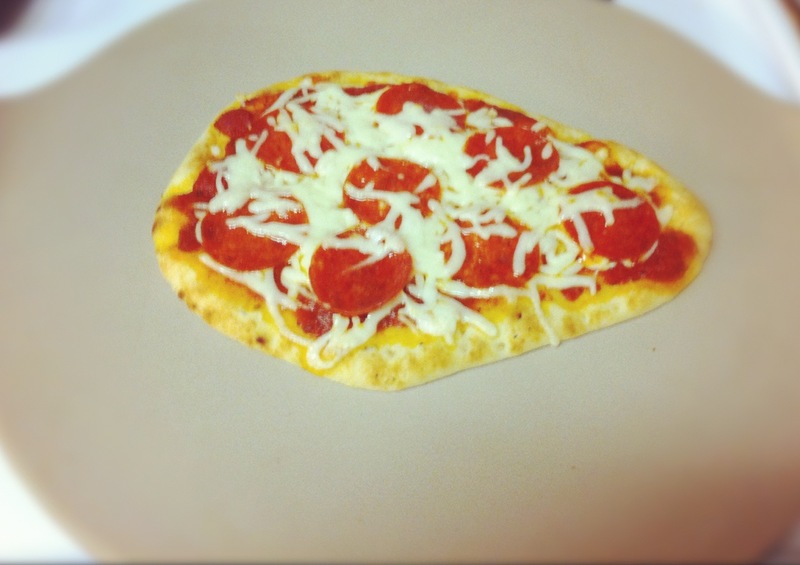 It is a premade, flat bread that is sold in a roundish shape and it comes with a recipe for pizza right on the back of the package! It is delicious by its self, so why wouldn’t it be just as yummy with cheese? Here I have gone the traditional route with mozzarella and pepperoni. Next I believe I am going to try mushrooms, greek olives, and feta cheese. The sky is the limit! Even play around with the sauce. I suggest trying pesto, alfredo, or even an avocado paste (such as guacamole) for some extra creative fun!